The PSC Racing Squadron offers members an opportunity to develop their racing skills right here on the Potomac River in a competitive yet friendly sailboat racing environment. Even if you have raced sailboats before, you will find the Upper Tidal Potomac a worthy challenge. For those who have never raced, the more relaxed racing environment of the Pentagon Racing Squadron offers a great opportunity to learn. The Racing Squadron is open to all PSC members who hold at least an American Sailing Association (ASA) 101 rating, or equivalent. Racing gives a goal and sense of purpose to time spent on the water. Racing builds boat handling and sail trim skills. Racing encourages sailors to become and remain active in sailing. Racers learn the rules of the road through constant application in close proximity to other boats. Racing requires teamwork -- crews must function as a well-tuned team to achieve success. PSC's Racing Squadron offers the opportunity to become a racing skipper and lead your own team to victory! Four series (six races each) held on Tuesday nights from April to September. One series (four races) held on Saturdays from September to November. The Pentagon Sailing Club Racing Squadron was founded in 2006 when PSC members John Cavedo and Charlie Peck decided to train a group of Pentagon Sailing members in sailboat racing, the nuances of sail trim, and the ISAF Racing Rules of Sailing. The program grew to a formal status in 2007, when PSC put together a formal Racing Squadron with its own charter, qualification process and Squadron Rules of the Road. To facilitate greater race opportunities, PSC teamed up with the Dangerfield Island Sailing Club (discsailing.org), the sponsor of our Tuesday night and most of our weekend races on the river. Tuesday night racing on PSC's fleet of Capri 22's runs from April through September. Tuesday races are hosted by the Daingerfield Island Sailing Club, and offer members a terrific opportunity to hone their skills while racing against a fleet of more than twenty boats on a typical night. Racers arrive at the Capital Cove Marina at Joint Base Anacostia Bolling around 4:30PM to get their crew and boat assignments and to make the boats ready for each race. The skippers cast off at 5:30PM, and races begin at 6:30PM. 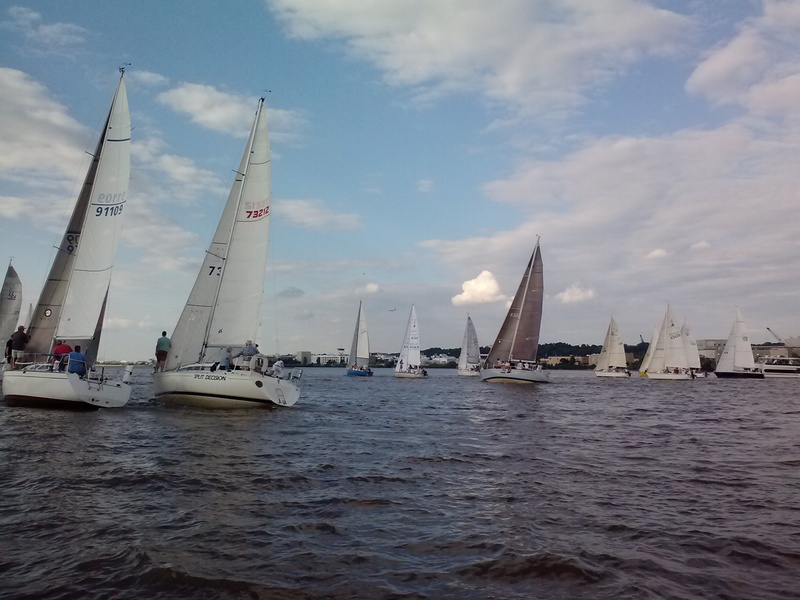 Boats return to Capital Cove around sunset, and the squadron typically has a post-race dinner together in the PSC clubhouse. The Racing Squadron participates in several weekend regattas and Saturday races each year. Among them, the Cherry Blossom Regatta is held in April; the GEICO Cup is held in June; and the Leukemia Cup Regatta is held in September. Aside from modest fundraising requirements for the Leukemia Cup, all of the regattas are included with PSC Racing membership. Racing Squadron membership is year-long, running from 15 March of the current year to 14 March of the following year. Racing Squadron membership fees are $250 for a full season and pro-rated for a partial season based on join date. How do I get started with Pentagon Racing? Join the PSC Racing Squadron for its 2019 Season! This sign-up sheet provides the year-long racing calendar, Racing Squadron member credentials, and post-race recaps. The Racing Rules of Sailing (RRS) govern the sport on the water. They are revised and published every four years by the International Sailing Federation. The current edition is available at the below URL. You can also download the complete RRS document and related publications. David Dellenbaugh's Speed & Smarts website and newsletter provide a wealth of great information on the sport of sailboat racing.